Family Tree of the Chieftains of the Dúnedain. Arnor. Elendil †S.A. 3441..., Eärendur 861. Arthedain. Amlaith of Fornost (eldest son of Eärendur) 946..., Arvedui Last-king †1975. End of the North-kingdom. Chieftains. 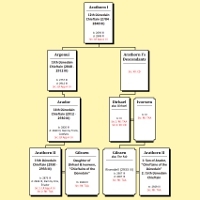 Aranarth (elder son of Arvedui) 2106, Arahael 2177, Aranuir 2247, Aravir 2319, Aragorn I †2327, Araglas 2455, Arahad I 2523, Aragost 2588, Aravorn 2654, Arahad II 2719, Arassuil 2784, Arathorn I †2848, Argonui 2912, Arador †2930, Arathorn II †2933, Aragorn II F.A. 120.